Meet Tomi Adeyemi (“Children of Blood and Bone”), Elizabeth Acevedo (“Poet X”), Tahereh Mafi (“Shatter Me” series), Angie Thomas (“The Hate U Give”) and Ibi Zoboi (“Black Enough”). On Saturday, Irving will become the center of the teen fiction universe. 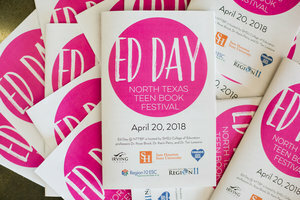 The North Texas Teen Book Festival kicks off, bringing 70 to 80 authors from around the country, including best-sellers and award-winners such as Tomi Adeyemi (“Children of Blood and Bone”), Elizabeth Acevedo (“Poet X”), Tahereh Mafi (“Shatter Me” series), Angie Thomas (“The Hate U Give”) and Ibi Zoboi (“Black Enough”). The festival focuses on young adult fiction (YA) and middle grade authors. YA is notable for the way it tackles serious topics, like immigration, racism, sexism and sexual assault, in an honest way. The YA fiction industry and fan base is enormous and very active on the Internet. More and more film adaptations are based on YA novels, like Angie Thomas’ “The Hate U Give” and Tahereh Mafi’s “Shatter Me.” Fort Worth’s own best-seller, Julie Murphy, whose novel “Dumplin'” is now a Netflix movie, will also be at the festival. Behind the scenes, a team of visionary organizers and volunteers work hard to bring this massive festival to reality. Admission is free. Funding for the festival comes from the city of Irving and from corporate sponsorship. The festival will be on Saturday, March 23 at the Irving Convention Center. All are welcome. No entrance fee, but parking is $10. Now in its fifth year, the festival was the brainchild of Dr. Rose Brock, of Sam Houston State University, and Kristin Treviño, of the Irving Public Library system. It all started when Irving Public Library system began holding author visits. The turnout was overwhelming; clearly teens wanted more authors to visit North Texas. From there, Treviño thought of holding a festival and spearheaded the initiative with Brock. In addition to Saturday’s festival, about 500 educators were expected to attend “Ed Day” on Friday. They’ll discuss curriculum building, classroom culture, and YA. What sets North Texas apart is the demographics of our attendees. We are 80 percent teens and 20 percent adults, and that’s kind of the flip of other big teen festivals. NTTBF has grown significantly since its inaugural festival in 2015, with 53 authors. Treviño and Brock said they’d be grateful if 500 attendees showed up. About 3,500 people attended. “Year two was the growing pain year, where we shot up to like 8,000 [attendees]. And that was the year that was the hardest, because we just weren’t expecting that. And years three and four, we were refining how to manage that many people,” Treviño said. Organizers start out with a wish-list of around 200 authors. They narrow it down to about 70, balancing popular authors with new talent. They also look for diversity, so readers see themselves in the stories discussed at NTTBF. Brock and Treviño enjoy hearing from attendees. They receive a lot of heartfelt letters. Kids say they met their new best friend or a new reading friend at the festival. Meet the NTTBF founders, Dr. Rose Brock and Kristin Treviño, and learn about the work behind educator and festival day. What’s your thought process behind developing Ed day? RBEd day is one year younger than the festival. It occurred to me we’re all working hard to put this amazing event together on Saturday for our community, and I feel like we’ve done that really successfully. I kind of had this epiphany, I was like, “We have all these people here. We’re bringing all these authors in, and we have all these educators.” And, so before I was a professor, I was a K-12 educator for 20 years. I was a classroom teacher, and I was a middle school librarian. What I know–what I saw–is that often the very same books are taught. And taught. And taught. I feel like there’s some great literary canon, but I think it’s also critical that kids in classrooms- we talk about kids not being engaged in reading- sometimes it’s just what they’re being asked to read is boring. Or it doesn’t fit anymore. There may have been a time for that, but we have to let books retire. Educators, you know teachers, have so many things that they have to do. Sometimes it’s really hard to figure out what the new thing is or, you know, what’s even out there. Because it can be overwhelming to go to a bookstore, and you see all the books, and trying to figure out what book would work in the classroom. Last year’s Edudcator (Ed) Day programs, photo courtesy of NTTBF. RB Or even instruction aside, I mean that’s one piece and it’s an important piece: we know all the research says having a strong library, certainly school libraries and public libraries but even classroom libraries are critical to reading success. If you think about it kids are going to their classroom teacher’s rooms every single day and they’re visiting those libraries. That’s the place where they’re definitely going to see a library, or not, if there’s not one. It’s a very rare thing where a teacher can go to a NCTE, which is the National Council of Teachers of English. In a school district, only one person goes, or one or two. Certainly not an entire staff, and every school has an entire English department or ELA department. So, and at those kinds of national conferences, these very things happen. But, again, very few people are getting to see that. There is no entrance fee– not for adults, and certainly not for kids. How do you maintain that level accessibility for such a large festival? KTOur supreme goal: if we could get all the funding–so, Rose and I, we’re from the library perspective. Access, access, access. And I wish that there was no fee-like, we can’t control parking. That’s the one thing. You do have to pay for parking, and parking’s $10 a car. You can buy out the parking, but it’s like extravagantly expensive. If we could get sponsorship to cover that, that is something I do think worth paying for. [Basically,] It’s really hard. Image of Mary HK Choi, author of the bestselling book “Emergency Contact” and the culture correspondent for Vice News Tonight, and Arvin Ahmadi, debut author of “Down and Across.” Photo courtesy of NTTBF. RBBasically, we don’t want any kind of gate keeping. Accessibility is everything. We know that the minute we start charging–the easy thing to put something like this on is to charge, because it’s tremendously expensive, as you can imagine, to rent out a convention center. There are so many costs involved in putting it together, which I think you recognize. But we know the minute we do that then some kids get to attend this. Absolutely, that right there creates a division on the have and have-not. KTIt is a definite challenge and we’re always trying to think like, ‘if you have any leads on corporate sponsorship!’ It’s really hard, but we just feel really, really strongly that the minute we start to charge then…I’d rather end it than have it become a Comic Con. We’ve even had coordinators of other big YA festivals nationwide ask us. That is another thing I’ve been told, because I have not really been to the other ones, what sets North Texas apart is the demographics of our attendees. We are 80 percent teens and 20 percent adults, and that’s kind of the flip of other big teen festivals. Publishers have told us that they don’t see teens come out en masse. And we’ve had other organizers of big huge festivals say, ‘How do you get the teens? How do you get all these buses to come here? We even pay for buses!’ We don’t pay for buses. We don’t pay for a single bus to come. It’s literally the North Texas [community.] It is the teachers, the librarians. We can have this all set up and pretty, but it’s everyone bringing the kids here. It’s a community effort.